Red foxes are a rusty reddish color on the upper side of their body and tail. They have a white underside, chin and throat. Their tail is very bushy with a characteristic white tip, and they have prominent pointed ears. The backs of the ears, lower legs and feet are black. 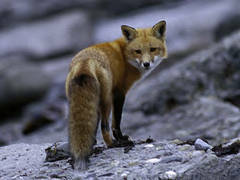 Other than the common rusty red, red foxes have three different color variations: a black phase where they are almost completely black, a silver phase in which they are black with silver-tipped hairs, and a "cross" phase where individuals are reddish brown with a dark cross across their shoulders. Adults typically stand 15 to 16 inches from the ground and are 35 to 41 inches in length. They can weigh between 8 and 15 pounds. The red fox has the largest distribution of any terrestrial carnivore found in the U.S., Canada, Great Britain and most of Europe, North Africa, parts of Asia and Australia. In the U.S., red foxes are found in most regions, except for western and very southern parts of the country. Red foxes are found throughout New Hampshire, unlike their cousins, the grey foxes, which are found mostly in southern parts of the state. In the 1930s and 1940s, fox hunting with dogs was a very popular sport. An average of 5,000 foxes were taken each year. Today, hunters only take a couple dozen individuals annually, and trappers have caught an average of 310 red foxes each year over the past ten years. Red foxes are often characterized as being cunning and in nature, because they exercise extreme caution and learn from experience quickly. Red foxes hunt primarily at night, feeding on vegetation in the summer, including corn, berries, apples, cherries, grapes, acorns and grasses, and on birds and small mammals during the winter. They also feed on invertebrates, such as grasshoppers, crickets, caterpillars and crayfish. Red foxes are cat-like when stalking prey, and their powerful legs allow them to reach speeds of 45 miles per hour. When foxes are full, they continue to hunt and store extra food in small burrows in snow, leaves and soft dirt. 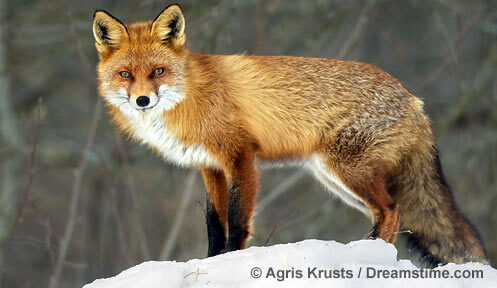 Adult red foxes are usually solitary until mating season, which runs from January until early March in New Hampshire. Red foxes attract each other with series of nocturnal barking. Females have a gestation period of roughly 50 days and give birth to a litter of 1 to 10 kits (or pups) between March and May. One main maternity den is established, with a number of emergency dens prepared by the females. Families stay together in the dens until the kits disperse at seven months old (usually early fall). Males will travel up to 150 miles away, while females tend to stay closer to home. Foxes are members of the canid, or dog, family, which includes wolves and coyotes. Canids tend to be quite vocal. High-pitched screams in the night that are often attributed to fisher cats are actually often noises from foxes. 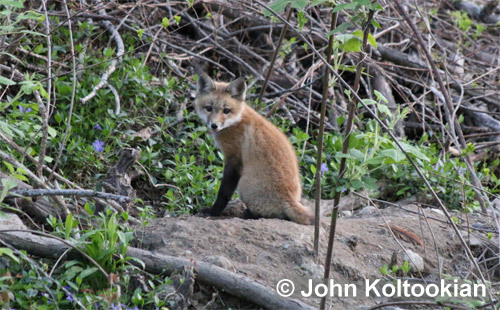 Red foxes live in extremely varied habitats, from urban centers to rural wilderness. Mixed cultivated and wooded areas and brushlands are perfect homes for this species, but they have been known to flourish in suburban neighborhoods and backyards. If you have a den on your property, do not worry – red foxes are usually harmless! Fish and Game suggests that they be left alone and outside pets, such as chickens, ducks, and rabbits, should be kept inside a sturdy fence to protect them from foxes. Red foxes can and do eat house cats, so keep your house cats indoors, especially at night. If you see any suspicious or alarming behavior exhibited by a fox, contact NH Fish and Game's Wildlife Division at (603) 271-2461. New Hampshire has a hunting and trapping season for both red and grey fox. Check the NH Hunting Digest or current season dates and other information about furbearers in New Hampshire. Diseases, such as mange, are nature’s way of keeping fox populations in check.